At our Mission Care Group centers we understand that no one likes dealing with insurance issues. They are complex and difficult to understand. But we can help. All of our centers are licensed by the State of California and are approved for Medicare, Medi-Cal and several HMO providers. Many of our services are covered by various private insurance plans. We’ll work closely with you to make sure you understand your benefits. Medicare benefits are available to people over 65 years of age and in some cases to those under 65. To qualify you or your loved one must have a Medicare card that reads “hospital insurance” and must have spent a minimum of three consecutive days (not counting the day you are discharged) in a hospital. The hospital stay must not have occurred more than 30 days prior to admission to our care center. 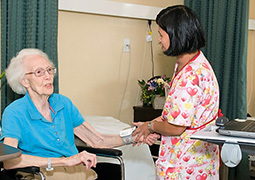 A physician must certify that the individual needs skilled nursing care on an on-going basis and the need for skilled nursing care must be related to the reason for the hospitalization. Coverage will pay for a semi-private room, meals, nursing services, rehabilitation services, medications, supplies and durable medical equipment for up to 100 days of skilled care. For the first 20 days in a nursing care center, Medicare covers 100 percent of skilled care. From day 21 through day 100, you or your loved one must pay a daily co-insurance rate. Those who are covered under Part B are responsible for an annual deductible plus 20 percent of the total charges for services such as therapy. The deductible also applies to medical supplies. Medi-Cal is a California and federal program that will pay most nursing care costs for people with limited assets and income. We can help you determine if you are eligible. Medicare Part A and Part B . These plans are used in addition to Medicare and will often help cover any co-pays that may incur from Medicare. There are many companies providing long-term care insurance. These insurance policies may help cover nursing home care. Our Business Office can help you understand what coverage you have. For those who have used up their Medicare benefits or do not qualify for Medi-Cal or do not have supplemental insurance with skilled nursing benefits, costs that are incurred can be billed. As a Medicare provider, we will ensure that you get the benefits you are entitled to you.